This type of drill is probably not in the arsenal of the average woodworker but were essential until the last part of the nineteenth century, although some are still in service. Fired clay and lead was also used but it wasn’t until the Industrial Revolution that cast iron would become common, prior to that time most water pipes were made from wood, well trees. The bits are modified shell or pod bits with parts that grab shavings so they can be pulled out as the hole is drilled. This type of bit will follow the center of the tree (they selected good straight trunks of the appropriate diameter), so the hole will be centered. What is unusual about this arrangement is the very long handle and the interchangable bits and reamers. Some pipe auger handles were segmented and lengths could be added as needed. The handles were slightly longer than the logs being made into water pipes. Twenty feet is not an uncommon length for the handles. There is a permanent set-up to do the work. Saw bucks or stantions to hold the log and smaller ones to hold the shank of the bit in the proper location. The work is done in green (unseasoned) wood, so the drilling is actually quite easy, but it is a lot of work. The handle is twisted (in either direction, usually) and the small bit is drilled all the way through the log/tree/pipe. After the pilot hole is bored, the bit is changed out to a reamer to enlarge the hole. In order to facilitate the reaming, a rope is run through the hole and fixed to the hook on the end of the reamer. Now the work gets easy for the fellow twisting the handle as they no longer need to push the auger, the fellow on the other end pulls the rope (also done with weights) pulling the reamer through the pilot hole enlarging the opening, as the handle is twisted. Sometimes the logs were squared off but often left round, some were hooped on the ends with iron, others not. Most had a taper on each end, one socket & one tenon and slip into each other forming a continuous water pipe. Buried in the ground they would last quite a while and I believe old wooden water pipes are still in use today. Some pipes were in places, on the surface in larger urban areas. And every Volunteer Fire Department carried a brace and bit, just in case they could tap a nearby water pipe for their bucket brigade or hand tub pumper. When the conflagration was out they would fill the hole with a bung called a ‘fire plug’. Now here is an interesting story of using a tool, not for its intended purpose. In the 1850’s when Europeans (white occupying forces) encountered the giant redwoods in California, they of course wanted to cut one down (they didn’t stop at one), however for the first one they used pipe augers. Two teams of workers (working on opposite sides of the tree) drilled a series of holes next each other at the same level, around the tree. Once these dozens and dozens of holes had been drilled to near the center of the huge trees (20 foot handled bits could only go in 20 feet from each edge toward the center), wedges were pounded in and the tree tipped over. 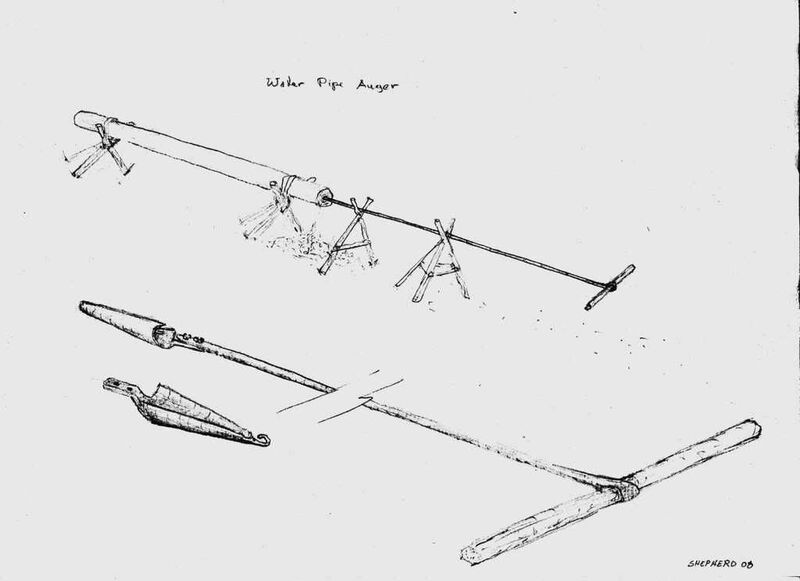 These are also called pump augers as they were used for making wooden water pumps to get water up from wells or cisterns. These of course would have shorter handles. If it were me and I was drilling a pilot hole lengthwise through a tree, I’d be sorely tempted to drill half way from each end, then let the reamer sort it out afterwards. That way the hole is centered on each end. And that may very well be the way this was accomplished, assuming you could ‘make ends meet’. Probably easier if some one was working on both ends at the same time, then stop short so as not to run the bits into each other. I also think the structure of the center of the tree contributes to being able to keep the hole in the center. And certain trees such as walnut and ash have a pith which acts as a pilot hole. I worked on 13 columns that were 16 feet long with the plinth blocks and capitals. they were drilled with pump augers and turned on a large lathe. The plinth blocks and capitals were turned seperately with grain oriented perpendicular to the grain of the columns. Were the holes drilled on the lathe, I somehow think so and these were made in about 1862. The holes could have been drilled then centered and turned, I am not sure. The columns were 16 inches in diameter at the swell and the hole was a little under two inches. The holes looked regular but over the length did have a bit of a bow in a few of them. Several looked very straight. There is a story behind these columns. They were the original columns to be used in the Tabernacle in Salt Lake City built in the 1860’s. When Brigham Young saw them (and here is the folklore or legend or story that he had a vision that these columns would not be strong enough and they should be replaced with coopered columns as they would be stronger). He was also an experienced woodworker and knew that coopered columns would be stronger than a solid tree and not as liable to spliting, as the originals did. So the columns in the Tabernacle are coopered with no splits and still holding strong after all these years. Fascinating. Who knew? A few questions. From your description and my imagination, I would assume that it would be feasible to make pipes with a wide variety of diameters. I would guess that anything from an inch or so up to 6 or even 8 inches and larger inside diameter would be quite possible. I suppose that larger diameters would be possible, but it seems the tooling requirements would start to change significantly, other technologies might start to be more viable, and well, who really needs a 12 inch pipe? That is a lot of liquid. I can easily envision joining the pipes together end to end with a mortise and tenon. A tight joint should be possible if it is turned on a lathe and when water is added, it should swell a bit. However, having done a bit of plumbing, I am still wondering about elbows, tees, and joining two pipes of two different diameters. Also, I am wondering if the pipes were glued (hide glue?) or mechanically fastened together or if friction, swelling, and perhaps a few shovelfuls of dirt were enough to keep things together. One rather significant detail that I am wondering about is the pipe wall thickness. Would the pipe wall thickness be that critical? Would thinner walls seep? Also, I can see that it would be advantageous to get off the bark, but do you think the sapwood should be trimmed off too? Another thing. It seems that wood that always has water (or worse, sewage), in it would be very prone to rotting and even more so if it is buried. Were these pipes typically treated with creosote or some kind of oil, did they have a usable live of just a few years, or am I missing part of the picture? Anyway, I can definitely see the advantage in making each section as long as is practical. Thanks for a glimpse into an trade that I never knew even existed. My apologies for all of the questions. I am not sure how large log water pipes can be but 8 to 10 inches is probably the largest. If a larger size was needed it was easier to cooper them together like a barrel with iron bands. And iron bands were used on some smaller solid log water pipes on the ends. The ends were tenoned off to fit the socket mortise in the next and the joint and a little oakum (untwisted hemp rope, tarred) pounded into the joint took care of any leaks. And when buried in the ground the wood will maintain as the wood is wet all the time, so rotting is reduced. Also they were used for fresh water, sewage went in the privy. Some pipes were tarred with asphaltum or painted to help protect them. The bark was removed for sure and I have only seen old pipes so it is difficult to tell if the sap wood was removed. If the pipe is full of water and in the ground and remains wet it will not rot. Rot happens when the pipe dries out. Also allowing the pipes to dry out could cause leakage problems. I know pine was used for water pipes, the pitch helps preserve the wood when wet. I am sure other trees that do not rot in the ground were used. Hickory being hard and heavy rots easily so it was not used. Making turns, elbows and diversions were done in wooden manifold boxes where pipe direction, size and number can be added or changed. These boxes would have a wooden lid or ‘manifold’ cover which is where the term man hole cover comes from. Hope that covered your questions. The tarred hemp rope trick for the joints makes a lot of sense. I never would have guessed that pine would be an appropriate wood for that. I can see that the inside might be preserved if the pipe is kept wet, but it seems like it would rot from the outside. That makes me wonder if the pipe wall thickness was somewhat critical and perhaps required that it be thick enough not to seep or break and thin enough to stay saturated. Or perhaps due to the nature of wood, particularly soft wood like pine, just about any wall thickness would stay saturated by nature of always having water on the inside. not the same story, but with a few facts presented. Thanks for the link, great story, mean time between failure (MTBF) looks pretty good. We moved to a homestead in So. OR in 1948. Things were quite primitive as we were 3 miles by mountain trail to the nearest road/neighbor. I remember long auger tools (up to 20′) with T handles. My older brother remembers wooden piping made from small-diameter trees. I would guess the augers drilled a hole of perhaps 3″. I am reseaching a 31/2 mile wooden flume in the same area. It was used to power two “giants” (for placer mining). A separate flume/ditch combination powered a sawmill around 1875 using an overshot wheel.